Bob Hope's former Palm Springs home as it looked last week. 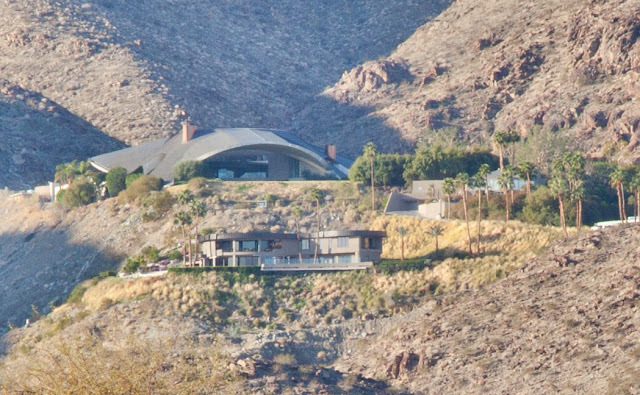 One of the most iconic Palm Springs homes, visible from many parts of the city, a round spaceship-like mid-century modern marvel has been placed on the market. The Bob Hope house is for sale. With a 50 million dollar asking price, does another celebrity have his or her eyes on the prize? The lucky person who can afford the multiple million dollar home gets a what the New York Times described as an abode "built like a volcano, a hole in its center opening a courtyard to the sky." Perhaps the most amazing aspect of the Bob and Dolores Hope is that they both lived to be over 100 years old, bringing more-than-a-lifetime of pleasure and laughs to millions of people around the world. In his movies, Hope defined the word funny to a generation from Hope's drag character in The Lemon Drop Kid, to his annual jaunts to war zones to give troops something to be happy about. We wait with baited breath to find out who will be the new owner and what he or she will do with the home. That is a lot of money. Does the house come with a pool? If so I'll take it. Looks really big compared to the building in front. 50 Mil, wow!